Spokes publishes cycle maps (also good for walking) for..
Edinburgh (10th edition, 2016) – £6.95. The 10th edition, published July 2016, includes all new facilities since the 2010 edition, including the Council’s network of signed ‘quiet routes’ which is currently being implemented. Since the first edition in 1987 we have sold over 120,000 copies – click here to see why!! For this edition, in response to popular request, the map is on tear- and water-resistant paper. Unfortunately there were severe problems getting the new base map needed to enable an electronic version, and so that has to await the 11th edition. East Lothian (4th edition, 2017) – £6.95. This new and fully-updated edition uses the same tear- and water-resistant paper as our 2016 Edinburgh map, which has been widely praised. This is the reason for the price increase to £6.95. 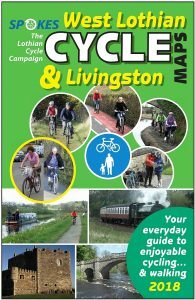 West Lothian & Livingston (4th edition, 2018) – £6.95. Includes detailed Livingston map on reverse, and main map extends east as far as Balerno & Edinburgh Gateway rail station. Uses tear- and water-resistant paper. Email… sustainabletransport@glasgow.gov.uk; Phone… 0141 287 9171. Note that Glasgow council online mapping is also available and includes bike hire and bike parking locations. The Spokes Edinburgh Cycle map is the essential guide to cycling in Edinburgh – over 100,000 of these fantastic maps have been sold since the first edition in 1987!! Roads and paths are marked according to suitability for cycling, and the latest edition includes the recent new and planned routes. Smaller scale maps on the reverse help you plan journeys further afield. The Glasgow map follows a similar approach. Our three Lothians maps are also of excellent design, with whole-area mapping at 1:30,000, distances between junctions, and a much-appreciated and easy-to-understand gradient system. The reverse sides have street plans at 1:10,000 of many of the towns (space permitting) and information about places of interest for visitors. You can view the coverage of each of the Edinburgh and Lothian’s maps by clicking on the appropriate link here: Edinburgh, East Lothian, Midlothian, West Lothian. Online purchasing of our maps is available from several stores (4 below) but not direct from Spokes. Old editions – If you find a shop selling an old-edition map, please inform Spokes. The current editions of each map are listed above. You do not need to add any postage to your order – we will pay the postage or may deliver your order if local. You can of course add a donation!! And why not join Spokes at the same time? Download a form here. Delivery time: note that we are all volunteers and are sometimes on holiday! Your order will normally arrive within 5-10 days, but if you are unlucky it might be up to 3 weeks or so. With any order by post you can request one free copy (per order) of either My Favourite Bike Ride or My Favourite Cycling Recipe [until stocks run out]. These booklets contain top entries from our Spokes annual competitions. This offer does not apply to orders by methods 2, 3 or 4 below. 3. Lothians businesses stocking Spokes maps – support your local shop! publicise to friends etc that these shops sell our cycle map! Bulk orders by shops (or others) are available at the discounted prices below – minimum order 6 copies of the Edinburgh map; or any 6 of the Lothians maps. If you belong to a bike group or workplace Bicycle User Group this is a great way for your members to get a map at below shop price, if 6 or more people want a copy. For example, RBS Gogarburn BUG sold 70 (yes, 70!) copies, a member in Ed Uni Parallel Computing Centre sold 28 and a government office bought 50 Edinburgh and 30 Lothians maps to sell at their staff sustainable travel roadshow. Other bulk orders – please post your letter with a cheque to our address in B(1) above. Note: Bulk prices only apply for orders of 6+ of any particular map. For example if you order 6 of Midlothian and 2 of East Lothian then only the Midlothians qualify for the bulk price, and the others should pay the standard price from section A above. However if you are ordering 100+ maps, this can include a mixture, all at the lowest bulk prices. We have a limited supply of unfolded maps, which are ideal if you wish to fix a map to a wall. When a bulk maps order is placed you can specify one of the maps to be an unfolded map (whilst flat stocks last). Due to the limited supply a maximum of one flat map can be ordered per 6 maps ordered in total (e.g. if you order 18 maps then you can specify that to include 1, 2 or 3 unfolded maps, not more). Spokes maps may not be copied, in whole or part, without permission, for which there may be a charge. While we make every effort to ensure the accuracy of Spokes maps, no map can ever be guaranteed free of errors. We would be grateful if you would let us know about any mistakes you spot, so that they can be corrected in the next edition. Please email spokes@spokes.org.uk. There is no rail station at Heriot on the Borders Railway. Unfortunately the 2015 edition of the map was published showing a station at Heriot and a number of copies had been sold before this error was brought to our attention. Spokes sincerely apologises to anyone who has been inconvenienced by this mistake on our part. We have since made a neat correction to the substantial number of copies still held in stock by Spokes. In our defence, the government’s original plan had no stations at all between Gorebridge and Galashiels but there were then strong local campaigns for stations at Heriot and Stow, both of which looked hopeful at one stage. There is now a station at Stow (beyond the lower edge of our map) but the Heriot campaign failed – although changes were made to the road layout in the village when a station was still thought to be a possibility. Occasionally special offers are announced in the Spokes Bulletin (only valid if in the latest bulletin) or in a blog article (only valid until date stated or, if no date stated, until next bulletin issued). Also, if you buy a map at a Spokes stall [for example at a Spokes public meeting or at a community festival] it is normally at a reduced price.